Years before we bought our lakehouse, I strong-armed a Realtor into taking me to see another house on our bay that was for sale. At the time, we had no plans to buy a lake house – and had no idea we’d end up on the exact same bay. I was just being nosy. Owning a house on Lake Superior seemed like such a dream and I wanted to peak behind the curtain. 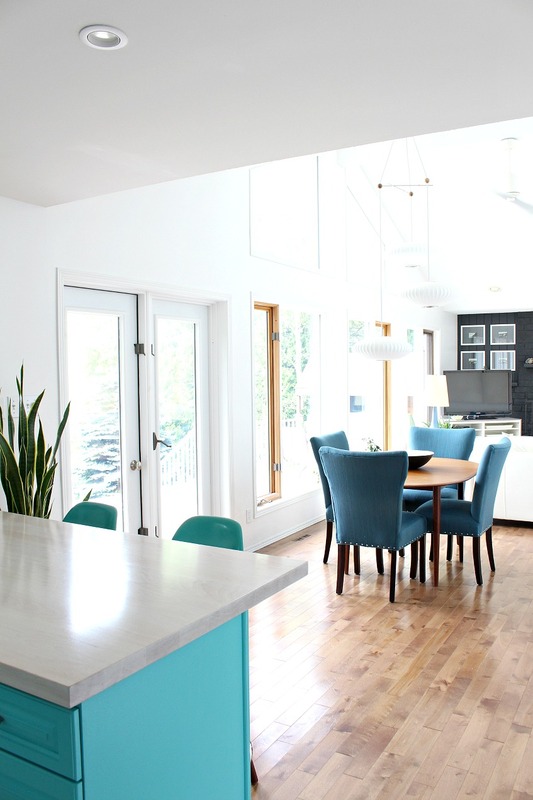 When we started thinking about our own dream house on the lake, I knew I wanted open concept – especially having experienced firsthand how much more spacious an impossibly tiny lake house could feel with an open floor plan. I wanted to be able to cook in the kitchen and still chat with guests in the dining room. I grew up in a small, post-war home with very distinct spaces and so many doors that they clanged against each other if we didn’t all move around the house in a coordinated manner. The townhouse offered a small taste of open concept living because the living and dining room were open to each other and the kitchen had a weird window that let in extra light, making it feel more connected to the rest of the home – despite having four solid walls. Despite its limitations, I was sold on the open concept floor plan because, to me, it made a small house feel more spacious and airy. One of the reasons we pounced on our house the way we did was that the size and floor plan felt so perfect for us. I loved that the living, dining and kitchen were open to each other and faced the lake, but I appreciated that the bathrooms and laundry room were tucked away in the back of the house. The only alteration I would have made would have been to create a sliding wall between the living room and bedroom so that the bedroom could enjoy a lake view too – just like that little house I toured, all those years ago. Nearly three years later, do I still love our open concept floor plan? That’s a question I’m asked quite often. But (there’s always a but!) 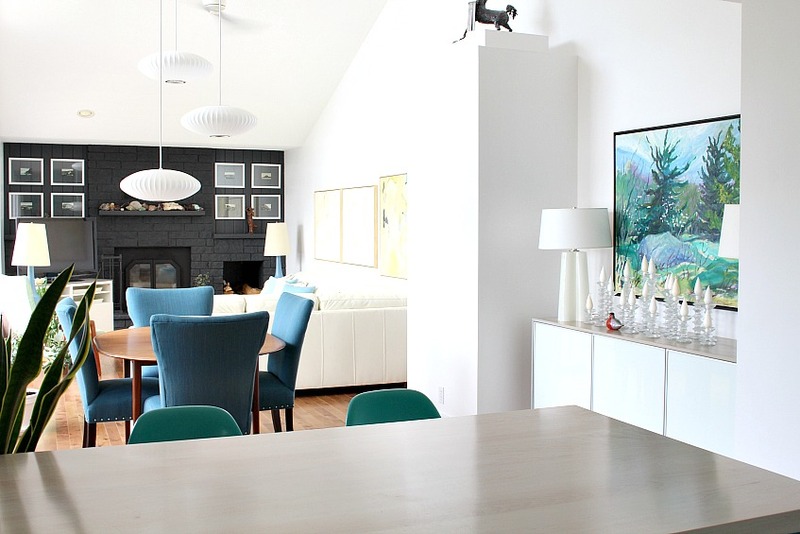 – there are a lot of pros and cons of open concept living to consider. As trendy as an open concept floor plan is, I don’t think it’s the right choice for everyone. In an article for The Comfortable House, I’ve done my best to flesh out the pros and cons of open concept living for anyone who is on the fence, or just nosy (like me). The points I’ve addressed are largely based on our lives, but it’s a really in depth read and I’ve done my best to explain how our lifestyle, family situation, and preferences impact how we use and enjoy the space. I’ve also tried to think about how other couples and families might benefit from – and be irritated by – an open living space. I’d love to hear your thoughts! It was a really fun article to write because I got to reflect on our life here in the lakehouse and try to remember a time when living here seemed like something that would never happen. I can see that little lake house I toured so long ago from my dining room! I drink my tea and look at it, thinking about just how interesting life’s journey is sometimes. Very comprehensive piece! I didn't think that 'nervous cook' was a thing, I would long to shut the door on guests/pups/kids 🙂 In my opinion, just the living room and dining room being open concept, like in your townhouse, is a good middle ground. I can totally understand that! Shutting the door is convenient, for sure. Yes, I know some nervous cooks who cannot stand to be watched while cooking. I get it, though, sometimes I make silly mistakes when people are watching. I would love an open plan layout in our next house, mostly so that I don't feel left out when I'm cooking dinner in the kitchen and everyone is in the living room watching tv and chatting and I'm missing out on all the fun! I know exactly the feeling – that's what I love about it, feeling included. Hopefully you get your open concept plan one day! Great points! Many of the cons, I wouldn't have thought of. I'm a big fan of open concept still, though. I like the togetherness factor- I hated feeling isolated in the kitchen of our last house. Our current house is quasi open concept- the now large kitchen connects to our shared dining / living space by an extra large doorway, that is nearly completely open. Although, by having the small wall sections in either side allows for some artwork (This weekend i hung 4 wall-mounted planters and a Staghorn fern on a board- so smitten)A couple of weeks ago, we chopped off a short peninsula that housed the dishwasher to simplify our counter/cabinet layout into a L configuration from the awkward U that rendered the corner cabinets (and the uppers near the peninsula) inaccessible and making space for a beautiful and way more functional island. Hubby built the island with barnboard and tinted concrete- I love it so much. It is located more in line with the dining/living space so I am more connected to the rest of the family while Im prepping and it invites others into the kitchen, as they lean on the other side (the search for bar stools is on) and chat while I'm there. Really love open concept for sure. I'm happy you liked the article! Ahhhh, your kitchen update sounds so good! You tease me with these descriptions, I wish you had a blog I could follow. I am glad you mentioned the corner cabinets weren't useful – you couldn't open the ones to the right of my kitchen, pre-deoaking. Everyone who likes the before sees so much storage, but that whole cabinet was unusable unless I was kneeling on the counter, lol. Your solution sounds like it's added so much function and style to your space. Your staghorn sounds cool, too.Yep, cons aside, I love open concept too. But I can totally see how it's not for everyone. I have lived in this flat for almost 30 years. It had a separate kitchen up to last summer! I really wonder after having thrown down the wall between the kitchen and the living room only last year how I lived before with that wall in between. It is so great to have an open kitchen,dining room and living room space all in one. Even when the kitchen is not all appropriately clean I don't mind. I so enjoy flowing from room to room with out being hindered by walls. And my flat looks so much bigger.And the counter space and cupboards are so much bigger now and I can even use the counter space for handicrafts. Love it!AriadnefromGreece! It was pictures of your kitchen on AT that caused me to start looking at your blog. 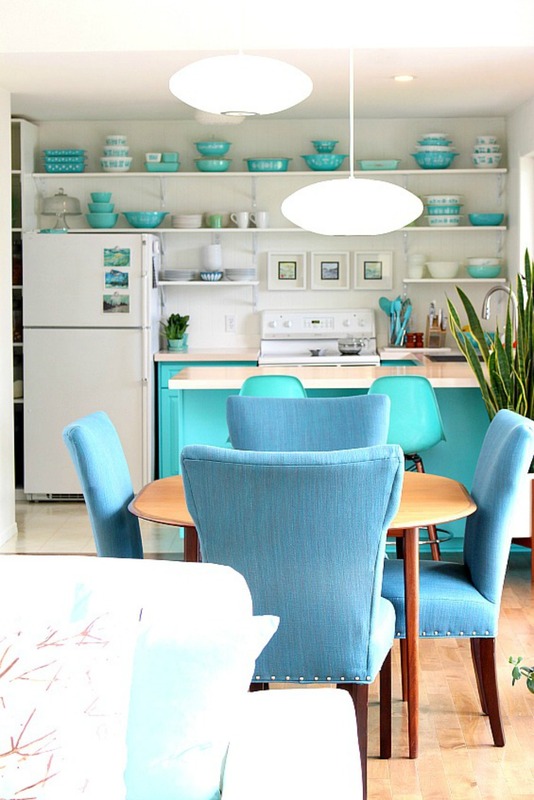 I absolutely love your kitchen and the openness! So happy to hear from another collector!! !